When we moved to Georgia, we got rid of a lot of stuff. We sold, gave away, and donated a lot of things that just didn’t make the cut on our moving trailer going down south. Sad for our old stuff….but fabulous for me. I could now scour the town (okay, craigslist, goodwill and fabric stores) for new stuff. So in case you too need a little pick-me-up in one of your rooms…..or just need a new focal point up on a shelf, hopefully something in this Decorate My Home series will spark an idea for you. But perhaps it’ll help pass a gloomy day or two as you skim through pictures of my efforts to scrounge up some inexpensive decorations. So, over the next several weeks, I will add things here and there that I have found and re-finished or made from scratch……..to make our little house our home. I first hemmed the sides of the curtain by folding ever each raw edge a 1/4 of an inch, then about a half inch….then sewed it in place. Then I hemmed the top the same way. Then I hung my curtain on the clips, just to see how it hung. And sure enough, I had to trim the left bottom side just a smidge. Then a little trick if you’re using flimsy fabric that blows around and doesn’t hang nicely…. Hem the bottom of your curtain, but with enough room to slide pennies in. Then slide the pennies all along the bottom hem. I used about 20. Maybe 25. Then I put two pennies stacked together in the very end and sewed the end shut. Then I sewed on the other side of those two pennies, just to keep it in place. Do this to both bottom corners. I did this to make sure that my bottom corners were always hanging nicely, and straight down. Nice and quick and fairly inexpensive. Especially if your fabric store is having a 50% off upholstery/drapery sale like mine was. This seriously beats paying for new curtains. Have you price checked those suckers lately? Love it, those are beautiful. I think I am going to need to do this. Looking forward to this series! Lovely. What a great idea to use the pennys as weights. You are so smart. Love the blog. Happy New Year! I just want to say that I LOVE your blog. I just found it and I'm excited. I have no clue how to sew, want to learn and just got a sewing machine for Christmas. Your basic sewing posts are really helping me. I go for my first sewing class next week. Thanks for all that you've posted and I'm excited to see more. Never thought about putting weights in the bottom of my curtains. Brilliant! Beautiful!! Will for sure be using this…I have 2 questions though…Is it safe to wash it with the pennies in there? and do you HAVE to use upholstery fabric? Can I use just regular cotton fabric? When we moved into this house last June I was on a mission to do all of the window treatments myself. I have done roman shades, panel curtains, all sorts or complicated and frustrating stuff. If only I had seen this sooner! I never thought of using one panel to cover a window, but it looks beautiful! Well done! That penny trick is awesome! lovely! and the penny trick is genius! absolutely cute, cute! AS ALWAYS! Perfect idea! I've been looking for curtains (I have my eye on some Pottery Barn ones for the girls room) but maybe I should take a trip to Joanns to see what fabric they have. …and when you're really poor and looking for spare change, you can always go to your curtains :) Glad to see you are gettting settled! Very cute…I bet it'd be really cute with some black fabric and maybe on the bottom to add a little length (and weight) to the bottom if you wanted them longer. Love it! Super cute! I really enjoy following your blog! Welcome to the south by the way! I'm actually really excitd about this series! I always want to do different decorating/organizing things to my house but can't ever figure out what to do that won't break the bank. I can't listen to those sites that talk about "affordable decorating." I'd like to know who can seriously afford that kind of decorating . . . So cute and I LOVE the penny trick! I'm going to try it. The penny trick is so much cheaper than regular weights. Nicely done! I am so excited for this! I was wondering where you got your fabric? It seems like you've posted links to places you've liked before, but I haven't ever bookmarked them or anything. They look great! Thanks! Neat trick with the pennies! Thanks for sharing!! Ashley! I don't know if you remember me, but I worked with Steve at Melaleuca and we lived at Main St. Station at the same time. We made wreaths once? Anyway, several girls were talking about this awesome blog at church so I decided to check it out and then I saw your picture! Holy cow! Sounds like you guys are doing awesome, and I am so impressed by all the amazing things you do. I love your blog! I love the penny tip and love the curtains. It's amazing how something so simple can make such a big difference to the feel of "Home"!!! Those curtains are so pretty. I love the fabric you used. I love it! I have to try that out as I am in deep need of curtains! we are moving into our new place at the end of jan…I will definitely be using this tutorial…cuz curtains are sooooo expensive! Thanks for the great tips! Also, you can make the panel a little wider and then fold the fabric before clipping it to create pleats! I have done this many, many times and it always looks great. I usually will accordion fold the fabric 2 or three times. The deeper you fold the fabric, the more pronounced the pleat. Looking forward to the fun series! Awesome, I am excited to see what else you share! You did a great job on the curtains! Wow! Great idea with the pennies! We've been in our new house for 7 months now and I'm still dragging my feet to put up curtains in one of the rooms. Nothing has captured my attention. Now I think I'll seriously measure the windows and start scouring the fabric stores! Fab curtains! You're right, buying them from the store these days is pretty pricey. Making them yourself is so easy, even for beginning sewers that can only sew simple things. Thank you for sharing this! I LOVED IT! I'm gonna go get some curtains done for our guest bedroom. Thanks again! Cut, easy, fast, and fun! Thanks! I love the penny idea. so many windows to cover inthis house…so little time! but this might be do-able. thanks! Curtains make the biggest difference – I'm a big believer. Love the penny trick! I'm so glad you have a new house- we just moved and I am working on projects too. Keep the great ideas coming! THANK YOU for doing this new series. After reading through all your comments I can see I'm not the only one that desperately needs affordable and cute ideas for their home. I'll be making things right along with you, starting with the curtains. If only I had seen this 2 years ago when I forked out way too much money to Pottery Barn for my daughters curtains. Live and learn! Oh my goodness this is GORGEOUS!! Great job!! Oh, and I blogged about your new series on my new craft blog. Thanks! Creative penny idea, I am so glad that you are back posting fun ideas. Can't wait to see what is next in your series!!! I would have never thought to use pennies as weights in the bottoms. I could actually try that trick with the curtains I made for our living room. The bottoms hang a bit wonky. Thank you for posting the tutorial. I'm bookmarking it for later use! Great idea. We used to shop at Hancock Fabric when I lived in GA. We're actually moving back soon(2 weeks) and are in the process of selling so much stuff. 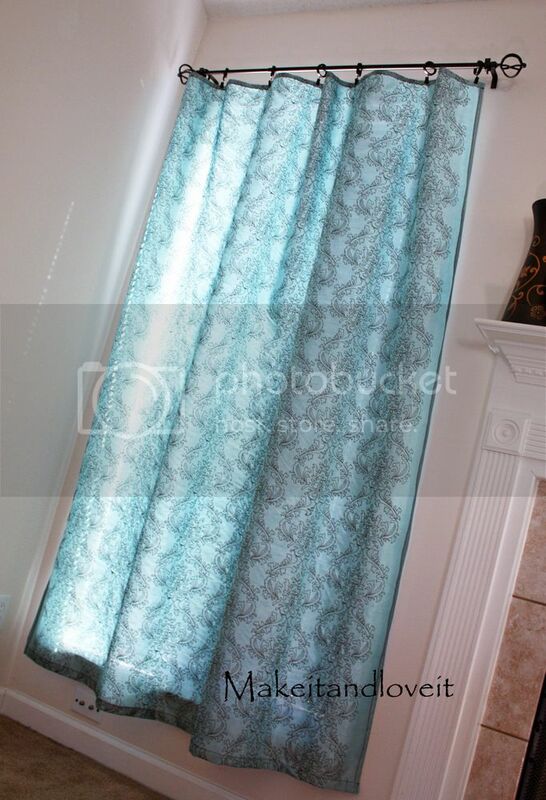 lining your curtains cuts the light, heat/cold and helps them hang nicely. plus, you won't see turquoise from outside. Thank you for the encouragement. I bought the fabric on the 50% off sale before Christmas and got the rods at Target for $7 ea. (were over $30 ea. )They are waiting on me to get that HUGE roll out and cut it. That is the scary part. Mine is heavier for drapes so I will be hemming with a 3 in hem but only rolled hem at top and sides. I think I can, I think I can. You amaze me! that's so cute! I love reading your ideas. I am so excited to see what you come up with for the home decor. Thanks for inspiring me. I just love looking at your stuff. The penny idea is priceless. I have heard of using magnets for added weight but pennies is a wonderful idea! Hey, Ashley, how do you get your name across your photos? Great job ! I keep promising my husband I will make curtains for our kitchen. I love the idea of clips and pennies in the bottom ! We totally need curtains, or valences, or something! We totally need curtains in our living room. Or valences, or something! awesome! Love the peeny trick! I love your fabric you used. Your curtains look so pretty. Also thanks for the penny trick. That is seriously beautiful! 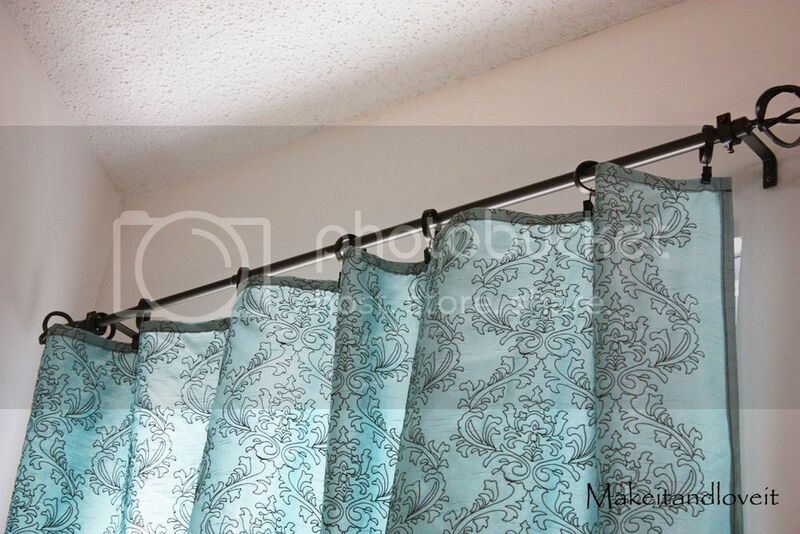 I never knew you could even buy curtain rods that "clip". Thanks for the demo!!! Love all your ideas. These curtains are especially cute. Another weight idea — ransack your husband's stash of hardware for washers. They do the trick, as well. Just in case you need more ideas for curtains. Yours look great! We do have wooden blinds, though, so at least there's something! love your blog! are you sure you got that fabric at hancock? i have searched and searched at the stores and online. that fabric would be PERFECT in our bedroom. thanks again for all the tutorials. Yes Holly, I got it at Hancock. It was on a big roll in the sale section. So maybe only certain stores are carrying it….and it's on its way out. Who knows? If you want me to see if it's still on sale at my store, buy you some, and then ship it to you…….wherever you are, send me an email and I would be happy to!! Very pretty I can't wait to try this idea myself! I just posted about the curtains I made from your tutorial. Thanks again for such a wonderful series! Instead of using pennies use small washers ( like bolts & washers) you can find them at your local hardware store. Or i just sneek into my husbands misc. drawers in his toolbox and always find some laying around. I like this idea but wish you showed the draperies w/ a liner-looks more professional & more expensive than seeing the hems all around the sides of the fabric. I did the same thing for one odd window in the dining room, but instead of penny weights I took a bunch of old earrings (broken, lost one, clip ons, etc) and sewed them to the bottom of the curtain. They function as weights and add a little glitter. I like to look for clearance table covers to use for curtains! I can usually find ones that are big enough to split in two pieces for around $15 at Marshalls or TJ Maxx. You can also use the matching cloth napkins to make pillows!